Concerns have been raised over mental health facilities and support available to Wits students. A THIRD Wits University student is believed to have committed suicide in the space of a year, raising concerns about support for students struggling with mental health issues. 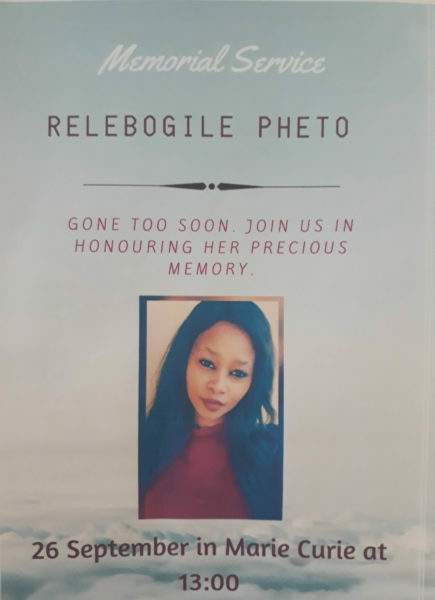 Relebogile Pheto, a second-year Oral Health Sciences student passed away in the early hours of Thursday, September 20. According to Professor Simon Nemutandani, the head of the school of Oral Health Sciences, Pheto “jumped from the 10th floor at J1 residence”, in Biccard Street, Braamfontein. It is not clear whether Pheto lived at the residence. A statement from the university confirmed the death of a student that it said passed away “under tragic circumstances”. According to Wits communications officer Buhle Zuma a case has been opened and police are currently investigating. Pheto was mourned at a memorial service on Wednesday, September 26, at the Health Sciences campus in Parktown which was attended by members of the Wits community, classmates, friends and family. Her death follows that of Sanele Dlamini, a second-year mining engineering student, who passed away after jumping from the third floor of the South Point building where he was staying. In October, 2017, second-year BA student, Kago Moeng, jumped from the sixth floor of the BlackBurn residence. Students dealing with mental health issues such as depression, anxiety and suicidal thoughts are directed to the university’s Career, Counselling and Development Unit (CCDU) but in the wake of Pheto’s death, students have taken to social media to criticise the services available to them at CCDU. Lol so I went to ccdu the other day to see if I can start sessions and I was put on a waiting list and I’ll only be seeing a therapist in a months time. Lmao,surely this must be a joke. Last night a student took her life. @WitsUniversity @AdHabb PLEASE take this more seriously. Please double the budget of CCDU so that mental health issues are dealt with. Second-year BHSc student, Mbalenhle Hadebe, said she turned to CCDU after she was advised to seek help and speak to someone last year. “With the timetable one has at med school, finding time was difficult but I did. I arranged a session with a psychologist,” she said. Hadebe told Wits Vuvuzela that she had confided in the psychologist but the session wasn’t helpful and she didn’t feel it was worth making more time out of her schedule to attend a second session. “This year August, I was suicidal. My friend said that she went there [CCDU] on my behalf seeking help and they told her they are busy and cannot help. All they did that day was send someone from res to come check up on me. Not even a psychologist,” she added. Hadebe said she was able to get assistance from Akeso, a mental healthcare facility offering specialised private inpatient care. Lindiwe Ntumba*, a fourth-year student, said she went to the CCDU in 2016 because she was in a bad space emotionally and wanted to seek out professional help. “When I got there I was scheduled to see a therapist a week from that specific day. The next day I tried to commit suicide. I was rushed to ICU and stayed in hospital for a week or so,” she added. “Mental health is overlooked at medical school. If Wits medical school took their students seriously, the suicide of one of their students wouldn’t have happened,” Ntumba said. A CCDU representative , who did not want to be named, told Wits Vuvuzela that they were seeing large numbers of students who felt suicidal. “We do want to say that we don’t turn students away at CCDU. A student will get an appointment with a psychologist if they come through to the CCDU. Due to staff shortages, the students at highest risk will get first priority to get an earlier appointment or will be hospitalised. “A student who is in need can come through to the CCDU and be seen by an intake therapist immediately. The intake therapist will always ask if the person is feeling suicidal and assess their risk. If the student is at high risk, the intake therapist will call Akeso to have the student hospitalised immediately. If the student is not at high risk, but needs counselling, the therapist will book a full counselling session and the student will leave the intake session with a date of their appointment. High risk students will be given earlier appointments. “Unfortunately we have found that the highest risk students really battle to talk to anyone, let alone a therapist so we appeal to the broader community to help by recognising that if someone feels hopeless and helpless that they be encouraged to talk to anyone, either the CCDU or someone that they trust,” the CCDU representative added. Tasmiah Mia*, in third year, said her experience at CCDU was generally positive. She said she sought help after she struggled with anxiety-related issues and attended 12 sessions in all. “It was really good – from the reception, to the first meeting, to getting an assigned counsellor. The standard of what Wits offers as a service is comparable to professional services which are R600 an hour.” She said the sessions were safe and provided a very comfortable experience where she felt in control. “It’s taking that first step and asking for help. Students complain about pressures but they don’t ask for help,” Mia added. Ntumba* said she did not think that CCDU was helpful unless you were in need of academic support. “I found out about Emthonjeni on campus a few weeks later and I found those sessions very professional and helpful. I’m in a much better place now,” she added. According to its website, the Emthonjeni Centre is an initiative by the School of Human and Community Development and offers psychological, social work, speech pathology and audiology services to the public. The Emthonjeni Centre is located on Wits East Campus and can be contacted using the following numbers: 011 717 8663 and 011 717 4513. The university has urged anyone who requires counselling to call 011 717 1940/32 or visit the CCDU website for more information. Health Sciences students can also call the Discovery 24-hour Helpline, 0800 323 323.